Thanks for all your continued feedback - we’ve been listening carefully and have continued to make a number of improvements and today we're releasing Patch 1.38. In this patch we’re introducing an overhauled save system, which makes managing saves between game modes much easier. Read on for full patch notes! If you experience any problems with the new save system, be sure to let us know[hellogames.zendesk.com]! Fixed an issue where storm-prone planets could be labelled as ‘Mild’. Storm frequency has not been adjusted - the text should now more accurately describe weather conditions. i guess some people really do hate this game and bash it till it is * non existant* and still continue to do so. Meh let them. But for me personally i love the game i love space games. I love seeing new stuff on each planet i go to. Bashing that crap isnt "getting old", because honesty never gets "old" : core mechanisms, and endless vaccum of content still do not justify to keep that thing at 60 bucks, other than grabbing as much money as possible. 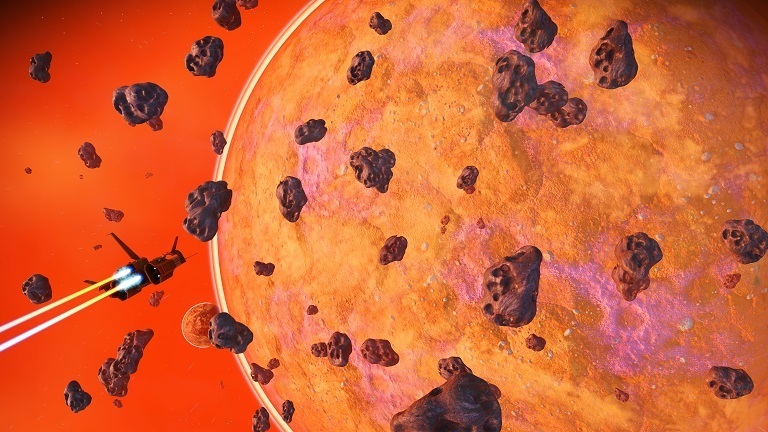 This game is a disaster and "modifying temperatures on planets" and other cheap features wont fix what is broken : the fun... : there is zero fun in this game because the promised features are still not implemented, and will obviously never be : 60$, especially in 2018, for this game, is lame. how can this still be $60..................because its worth it. No matter what that lying bla bla bla sack of s**t for this useless software..........its a game. a good one what more do you want. stinking crooks.......................why, for creating a good game and asking to be paid for it??? its insulting for putting this out.............................humm...i would find it more insulting if there were no updates. Continuing efforts make it better and better a YEAR LATTER. most other game makers would have long since evaporated by now. think it over. There is no reason to keep bashing this game (its getting old), This gem is now AND CONTINUES TO BE improving constantly with every (FREE) update. Its time we gave the No Man's Sky crew their due praise for pushing out top notch quality content that is making this an increasingly deep and fantastic space epic! Face it there is nothing else like it. You have exploration, trading, farming, upgrades to all equipment, goals, missions, factions that you can buddy up with gifts to get discounts, ship trading and swapping, upgrades requiring blueprints! scanning for credits, a remarkable GALAXY MAP (yes it is), space combat YAY, F***G freighters THAT YOU CAN OWN AND LAND ON! Ok I'm stopping here you get the picture. A TRUE SPACE SANDBOX! Come back and do yourself a favor and dive in to this ADVENTURE and start enjoying it. For those of us that didn't jump on the bashwagon its nice to have no bad taste I'm our mouth and get immerse in what I am calling the "Space Adventure Game of our times"
Why is this still $60?